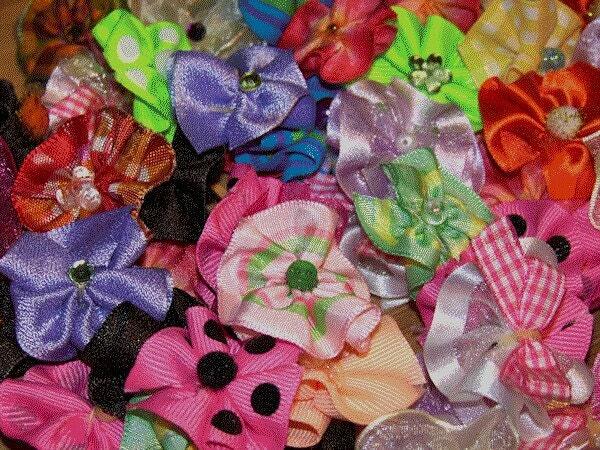 Dog grooming bow assortment perfect for the busy groomer! Use for top knots, collar bows, ear bows, or bow ties. An excellent finishing touch. 12 pairs - 24 bows. Each bow is hand made and has a bit of bling (rhinestone, gem, pompom, resin, button, etc) securely glued to it. All my bows are handmade by me from purchasing the ribbon to shipping - I do not broker bows. Love these-they are so adorable. Also they came so fast! Thank you! 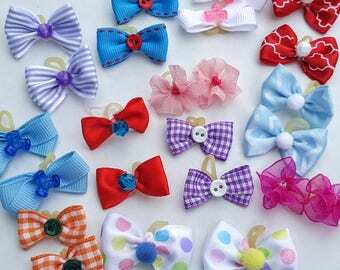 Perfect assortment of fabric bows in just the right size. The elastic band attached ensures the bow stays in place, unlike other’s bows who’s clips came right off with a quick swipe of my dogs paw. Can’t wait to try them all out!